Aberdeen manager Derek McInnes says referee Steven McLean will be "embarrassed" when he sees a replay of the goal that led to the Dons 1-0 defeat by Motherwell. Jamie Langfield appeared to be fouled by John Sutton in the lead up to Craig Reid's last-gasp winner. "It's stonewall, a terrible challenge," McInnes told BBC Radio Scotland. "It's a free-kick on my goalkeeper every day of the week and I think if he sees it again he'll be embarrassed." Aberdeen dominated for large spells of the match and hit the bar through Jonny Hayes, while Niall McGinn was twice denied when one-on-one with goalkeeper Lee Hollis. 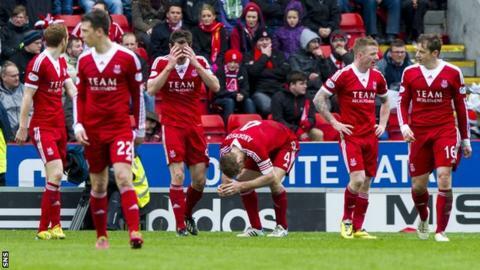 Peter Pawlett also rounded the keeper and looked set to fire Aberdeen in front only to be wrongly flagged offside. "We congratulate Motherwell because they've had a great season but they've won today on the back of a some poor refereeing decisions," he said. "We were in total control of the game. Motherwell had offered very little in the game if truth be told, they were hanging on at times. "I thought we kept the ball really well, and maybe it wasn't exciting enough for some. Maybe people are looking for a bit more drama. "I didn't think it was going to play out that way at all, we were very comfortable." And, of the goal, McInnes added: "[The foul on Langfield] should have been picked up. I was delighted when I saw Steven McLean was the referee today, one of our better referees. "I think at the free-kick prior to it going into our box it was taken at the wrong place as well. It was more or less five yards at the other side of the half-way line but that wasn't where the challenge was. "It might just seem like a little thing but it becomes a big thing and John Sutton's barged into Jamie Langfield."